These little brown birds are incredible singers! There are nearly ninety species of wrens in the world, and quite a few are exceptional singers. Nearly all of them reside in the Western Hemisphere, with the majority living in Central and South America. The White-bellied Wren ranks among the tiniest, at just under four inches, while the Giant Wren is nearly nine inches long—as big as a Red-winged Blackbird. And the most legendary singer? It’s a tough decision, but many would choose this Musician Wren from South America. If we ran down the list of our most familiar songbirds—like crows, robins, and jays—we wouldn’t have to go all that far to reach the wrens. They are little brown birds with cocked tails—and big voices. There are nearly ninety species of wrens in the world. Nearly all of them reside in the Western Hemisphere, from Alaska to the Falkland Islands. The majority live in Central and South America. And quite a few are exceptional singers. Many wrens are small and secretive. 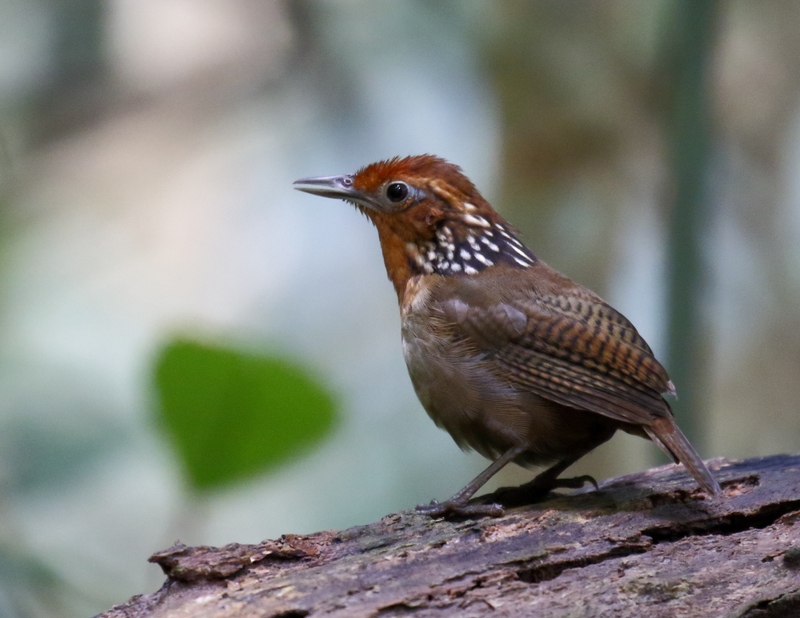 The White-bellied Wren of Mexico, Guatemala, and Belize ranks among the tiniest, at just under four inches. The White-bellied Wren is tough to get a look at, but its brisk, musical song reveals its presence as it skulks through the tropical underbrush. The largest of wrens, the Giant Wren, is found only in a small area of Mexico and Guatemala. Giant Wrens are as big as Red-winged Blackbirds, nearly nine inches long, with rusty brown backs and white undersides. Far from shy, they call raucously as they chase one another through open woodlands. Among all the wrens which is the most legendary singer? It’s a tough decision, but many would choose South America’s Musician Wren. Learn more about this little bird’s special song on our website, BirdNote Dot Org. Bird sounds provided by The Macaulay Library of Natural Sounds at the Cornell Lab of Ornithology, Ithaca, New York. Recorded by Bob McGuire, 139416 Gregory Budney, 103348 Matthew D. Medler, L. Irby Davis, and Curtis Marantz.